I’m aiming to raise 12-24 five-frame nucs this summer to populate new apiaries and provide bees for my day job. 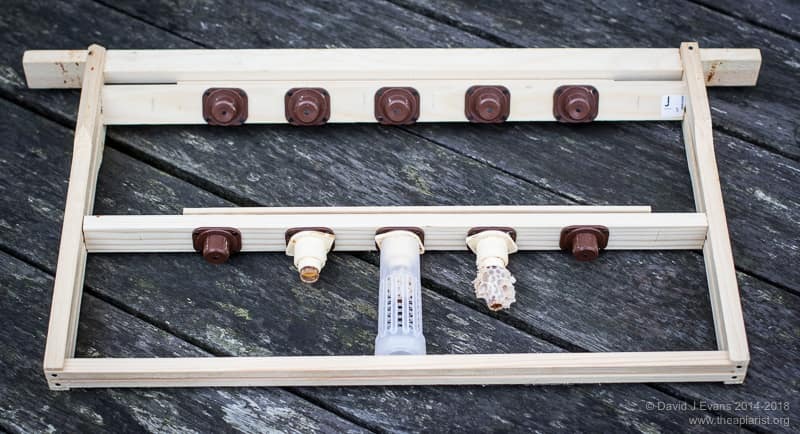 These will also provide the stocks to replace early season sales of overwintered nucs and donations to friends struggling with misbehaving colonies. 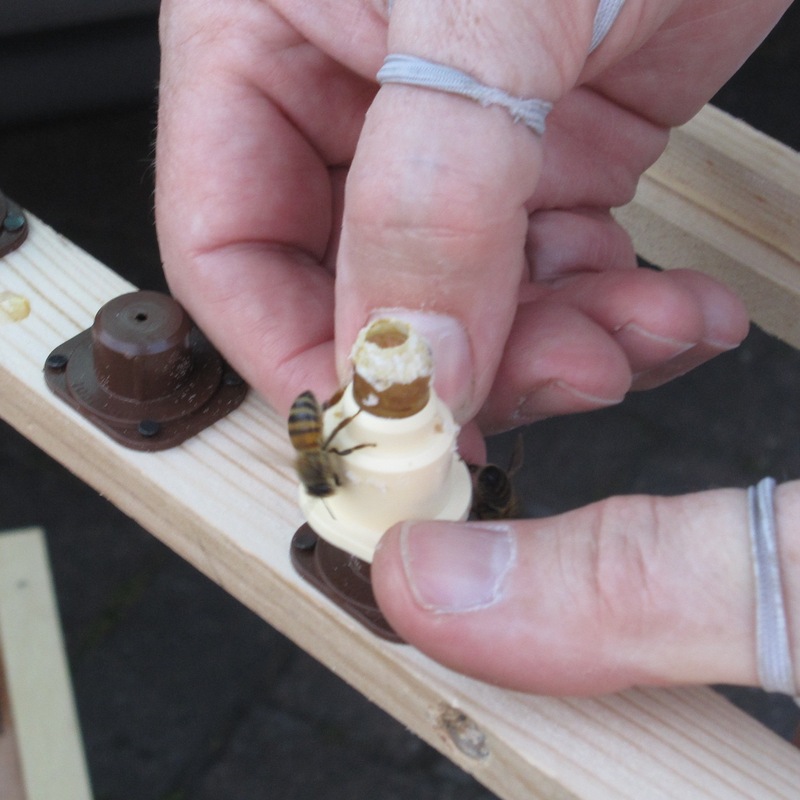 The first round of grafting started relatively late (16/5/15) due to the protracted cool weather this spring – even had I managed to raise queens, the prospect of getting them successfully mated would have been limited. Larvae were selected for grafting from one of my best colonies – chosen on the basis of the desirable characteristics I’m able to easily subjectively judge. These include disease, good behaviour and performance. Disease and behaviour are straightforward – obvious signs of chalkbrood or deformed wing virus, running excessively on the frame, following, pinging off the veil or attacking a hand slowly moved over an open colony would all preclude a colony from being used as a source of larvae for grafting. Performance is far more difficult to judge when comparing a relatively small number of colonies. I look for colonies that overwinter well, that build up strongly in Spring and that are headed by queens that exhibit a good laying pattern. I chose a strong, healthy colony for queen rearing using the Ben Harden queenright system. Despite their vigour, this colony was also bad tempered and unpleasant to handle. With queens, nature is all-important, whereas nurture is only relevant in terms of feeding the developing larvae … using a bad tempered colony to raise cells does not influence the temper of the colony headed by the resulting queens (at least, this appears to be the case and I’ve not seen anything to suggest otherwise). I therefore sacrificed the queen and split the cell raising colony up to populate the nucs for queen mating. A single brood box setup for queenright queen rearing will probably have at least 10 frames of brood at this stage of the season – most of these are in the bottom box, with a frame or two of (now likely sealed) brood adjacent to the cell bar frame in the upper box, flanked by the fat dummies. These brood frames, and the adhering young bees, can be divided approximately equally amongst a number of 5/6 frame nucs arranged in an inward facing circle around the original colony (which is disassembled and removed during the process). The returning or displaced foragers should then distribute themselves roughly equally amongst the nucs. This method was developed by Vince Cook, a New Zealand beekeeper, and is described briefly in his small book Queen rearing simplified. This was something I’d not previously tried. I usually either make nucs up and move them to an another apiary to prevent the loss of returning foragers, or make up mini-nucs for queen mating by harvesting nurse bees. However, the unpleasant temperament of the cell raising colony meant that this was an ideal opportunity to sacrifice the queen and use the entire colony to populate nucs for mating the newly raised queens. 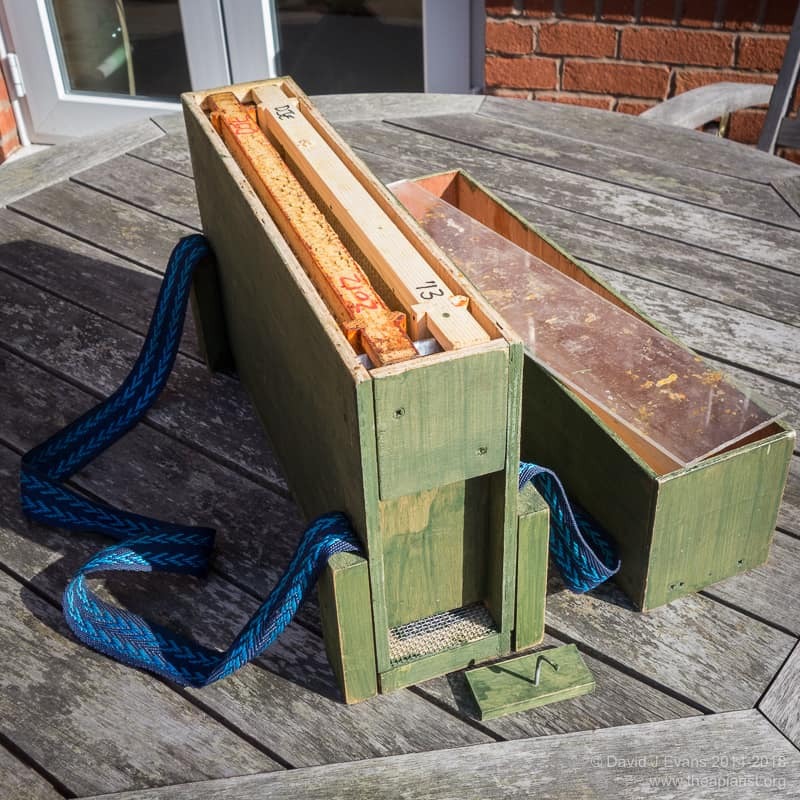 On arrival at the apiary I very gently smoked the cell raiser, removed the cell bar frame containing the caged queen cells and placed it – together with a few hundred adhering bees – in a two frame nuc box for safe keeping. I removed the upper brood box and placed it on an adjacent hive stand and then went quickly through the lower brood box, found the queen and put her in a cage in my pocket. 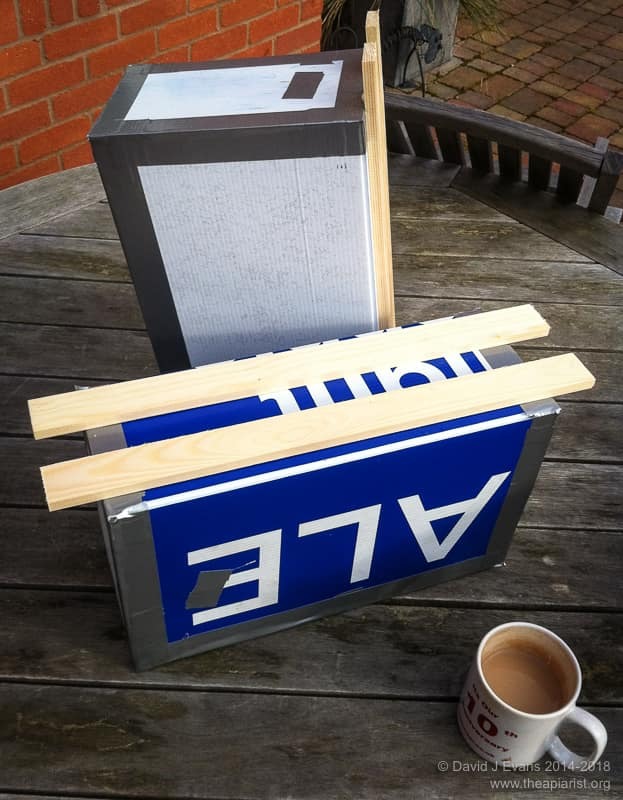 Each nuc box already contained a frame of stores, a frame of foundation and a dummy board. 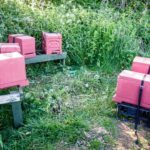 It was then a simple case of going through the brood boxes distributing sealed brood and associated bees approximately evenly around the circle of nucs. I didn’t shake any bees into the boxes. Some bees were milling around, but – perhaps because it was relatively late in the day and I used the minimum amount of smoke and was as gentle as practical – the majority stayed on the frames. With something like 11-13 frames of brood – some all sealed, some drone, some frames only recently laid up – this was not an exact science. Having distributed the brood and frames from the donor colony I then retrieved the sealed queen cells and placed one in each of the nucs, pushed into the comb an inch or two from the top bar, using the ‘ears’ on the Nicot cup holder embedded in the comb and trapped in place with the adjacent frame. Finally, I made up each nuc box with additional frames of foundation or drawn comb, pushed the frames gently together and replaced the crownboard and roof. Each was then firmly strapped onto the hive stand. A day or two after the virgin queen should have emerged (but well before any mating flights might occur i.e. 5-6 days after emergence) I checked the – approximate – circle of nucs to ensure they were reasonably well balanced in terms of strength. Using the gentlest waft of smoke I separated the frames and retrieved the – now vacated – queen cell. All the queens had emerged and should get mated over the next couple of weeks … during which time they will be left undisturbed. It was interesting to note that the nucs were all very well behaved when I checked them, despite originating from a colony that has been consistently unpleasant all season. 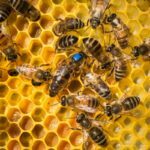 This isn’t unusual – small colonies are almost always better behaved than full colonies and the presence of a queen, even a newly emerged virgin, often noticeably settles a colony down. Queen rearing using a Cloake board, something I’ve not used before. 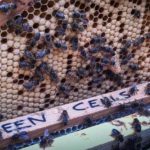 This entry was posted in Beekeeping, Queen rearing and tagged Ben Harden, circle split, mating, Nucs, poly, queen cells, queen rearing, Vince Cook on May 30, 2015 by David. 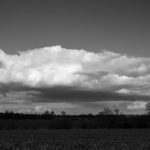 The weather continues to be unseasonably cool, with this week being pretty typical of what we’ve recently been experiencing. Nevertheless, I’m assuming it will pick up when we get to June so have finally started queen rearing. In previous years I’ve had mated queens in the first week of May, so we’re nearly a month late. I set up a strong colony (with poor temper – these are destined for requeening as a priority) as a queenright cell raiser using the Ben Harden system, grafted on Saturday and checked them 24 hours later. Seven or eight of the 10 grafts appear to have taken, with a 3-4mm collar of fresh wax around the lip of the plastic cell cup. In the image above the two covered with bees and #4 and #6 have this collar. If you look inside the cell you can see a larva floating in a bed of Royal Jelly. In contrast, #3 and #5 have only a very short wax collar and the cells are empty – for whatever reason these larvae have been rejected. I’m a little concerned that #4 and #6 aren’t getting a lot of attention from bees … time will tell if these have worked. This entry was posted in Beekeeping, Queen rearing and tagged Ben Harden, grafting, queen rearing on May 18, 2015 by David. The oil seed reap (OSR) and hawthorn have finished here and there’s very little forage available for colonies. To make matters worse the weather has been changeable, restricting the time available for colonies to forage. Small colonies, such as casts that have been attracted to bait hives, have lacked sufficient numbers of foragers to store any nectar and have needed feeding. Small, weak, nucleus colonies have starved unless supplemented with syrup. In contrast, large swarms have fared much better – it’s almost as if there’s some sort of size threshold below which the colony isn’t able to cope with adverse conditions. This poor weather has caused significant problems for queen rearing. Virgin queens are taking ages to get mated, far longer than happens in settled weather. 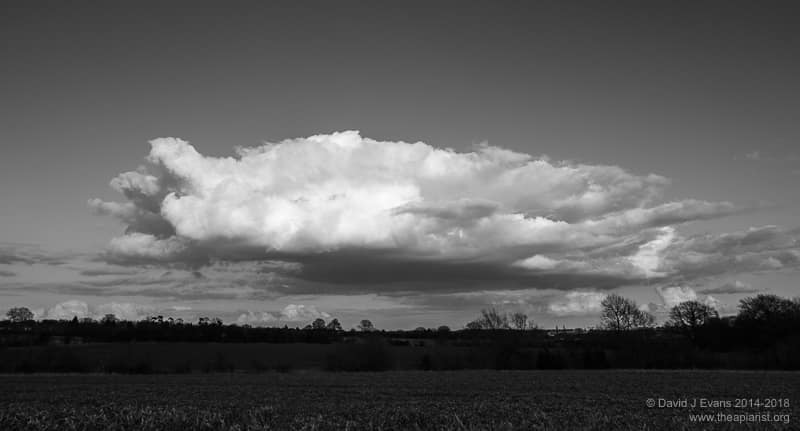 Many of the days have had warm, clear mornings, but with thunderclouds building up around lunchtime leading to a deluge in the afternoon – the peak time for queen mating. Many mating hives have gone queenless over the last fortnight. Without a significant flow, getting cells started – at least in the queenright queen rearing system I use (the Ben Harden method) – means the colony must be fed syrup for the few days between adding the grafted larvae to the cell raising colony and the 9th day (after egg laying) when the cells are sealed. 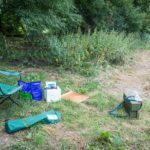 There’s not much that can be done about improving the chances of getting queens mated, other than ensuring a supply of freshly emerged virgin queens ready to take advantage of any suitable breaks in the weather. After more than three weeks in a 2-3 frame nucleus I’m usually pessimistic about the chances of getting the queen successfully mated. In contrast, with relatively little effort you can feed syrup to the cell raising colony, thereby ensuring the larvae are given the best chance of success. If the cell raising colony has supers on I temporarily remove them to another hive to prevent the bees simply storing syrup in with nectar. 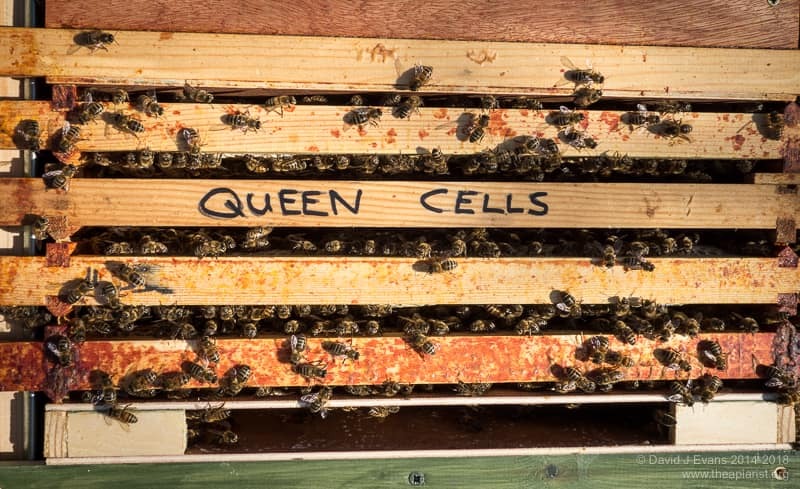 In practice the easiest way to achieve this is to set up the queenright cell raiser the day before grafting (as described in detail previously) with a clearer board on top of the upper brood box, beneath the supers. When you come to add the grafted larvae, first remove the supers which are now cleared of bees and put them aside, gently slide the cell bar frame between the frame of unsealed larvae and pollen, add 150-200ml or 1:1 w/v (thin) syrup to either a fat dummy feeder or frame feeder in the upper brood box, then put the crownboard and roof back. Add the removed supers to other strong colonies in the apiary. Unless the weather dramatically improves I then check the colony daily, adding a further 150-200ml of thin syrup to the feeder. This just takes a few minutes and results in minimum disruption … a quick waft of smoke at the entrance, the same amount through a slight gap beneath the raised corner of the crownboard and then gently remove the crownboard. The day after grafting I check the larvae to see how many have been accepted. There’s no need to check the cells on the next 3 days (despite the picture shown here), simply add a bit more syrup to the feeder. On the fifth day after grafting the cells should be sealed and there is no longer any need to continue feeding. 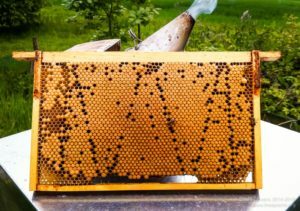 In addition to preventing tainting the honey supers with syrup, removing the supers also concentrates bees into the brood boxes. 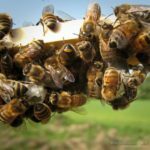 This entry was posted in Beekeeping, Queen rearing, Seasonal and tagged Ben Harden, fat dummies, feeding, grafting, queen rearing, queenright, syrup on June 11, 2014 by David. With any queen rearing it is critical to be aware of the timetable. Eggs are laid, hatch on day three, grafted on day 4, queen cells are sealed on day 9 and the virgin queens emerge on day 16. 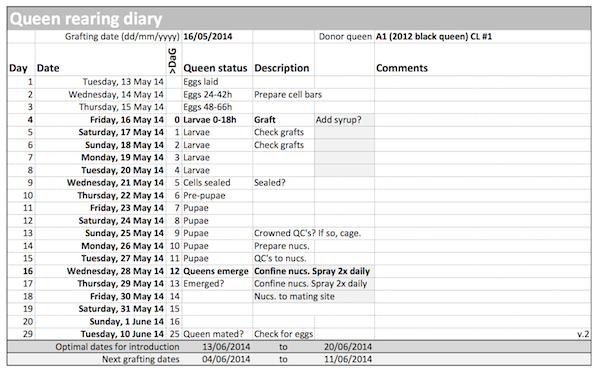 There’s not much variation around these timings; if you graft a larva that is too old it will still be sealed into the cell on day 9 (after the egg was laid), but will have had less opportunity to feed well and so may generate a sub-standard (‘scrub’) queen. If you thought the larva was 18-24 hours old, but it was actually 48-60 hours old, it will emerge up to a day and a half before you expect it to. This is “not a good thing” as the newly emerged virgin will run amok through the colony destroying all the other queen cells which will then be partly or completely torn down. Alternatively, if all of the larvae are a little older than you thought they’ll all emerge and have a melee in the upper brood box of your colony setup for Ben Harden queen rearing. If you’re really unlucky an undersized virgin will squeeze through the queen excluder and slaughter your mated, laying, queen in the bottom box. All of this can be avoided by understanding the timing of events involved in queen development and keeping good records. 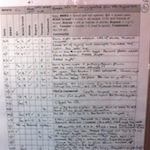 BIBBA provide a copy of Tom Robinson’s table, essentially a queen rearing diary in Excel format. 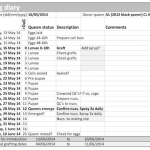 It’s designed for using Jenter or Cupkit systems, rather than grafting, but the underlying development timetable – the dates when the cells are sealed and when the queen emerges – are of course identical. I’ve modified a copy to suit my own queen rearing programme, using grafting and mini-nucs. By simply entering the grafting date, the remainder of the timetable is automagically completed, so there should be no reason to miss one of the critical dates. 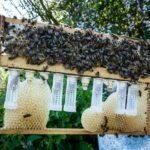 In the same way that good records are required to select stock to graft from, you should keep a record of both the queen rearing activity and the performance of the resulting queens. Graft young larvae only – following the guidance in the earlier post on grafting. Check the larvae within 24 hours to ensure they have been accepted. Check on the day the cells should be sealed. Check them finally 24-48 hours before expected emergence. By this time the sealed cell may show signs of being crowned – a sort of thin darkened ring around the tip of the cell which is a good indication that emergence is going to happen shortly. Cage the cells in a hair roller to trap any virgin queens that emerge earlier than expected (you can do this anytime after they’re sealed). Use the cells before the queen emerges. Keep good records and remember that queen development is unaffected by the vagaries of the weather or your social diary … graft young larvae and use the resulting queen cells 10 days later. With a little practice a success rate of at least 80% should be achievable when grafting. As described previously, you can easy tell whether the grafting has worked by examining the cell cups about 24 hours later. You’re looking for a 3-4mm relatively smooth, slightly curved wax rim added to the cell. It’s very thin and fragile at this stage. Accepted grafts will also be covered with workers building the cells and feeding the larvae – you may not be able to see the spigot or cell cup at all. Gently move these bees aside if necessary (don’t shake or brush them off) with your finger. It’s actually possible to determine whether the larvae are accepted as little as a couple of hours after grafting but I usually prefer not to disturb the colony again (and often graft late afternoon, so it’s usually getting too late in the day). Assuming the cell raising colony is wells stocked with bees I rearrange the boxes at this first inspection so that the Ben Harden brood box is on the top of the stack. The main reason to do this is to save your back. Only do it if there are ample bees in the colony; you do not want the cells to get chilled by placing them over a couple of near-empty supers. In a strong colony, I’ve had three or four supers separating the queenright bottom brood box and the cell raising brood box. In the picture (right) the hive nearest the camera is a Ben Harden cell raising colony. There are three near-full supers between the lower and upper (BH setup) brood box. In addition, since the OSR is nearly over and the stores are capped, I’ve moved one full super over a clearer board above the upper brood box, emptying it ready for extraction. The next few days are critical. The larvae need to be well fed and the cells need to be drawn out fully. If there’s no flow the cells may be ignored. To prevent this feed a small amount of thin syrup (1:1 w/v) in a frame feeder in the upper box. This is where a fat dummy with an integrated feeder is useful. Arrange this so that the feeder is next to one of the two pollen frames and add about 100-150ml of syrup daily until the cells are sealed. You barely need to disturb the colony to do this … a waft of smoke, lift or slide aside the crown board, add the syrup and close up again. There’s no need to check the cells, the frame of unsealed brood or the bottom box (we’ll come back to these two shortly). If there is a good flow it is not necessary to feed the colony. Since this is essentially a standard production colony (with an additional upper brood box) the bees should continue to store nectar in the supers. Five days after grafting the cells should be sealed or about to be sealed. The cells will by now be reasonably well sculpted, with a characteristic pitted appearance. The exception is the cell tip which will be pale smooth wax. When checking the cells don’t shake or jolt the cell bar frame and don’t keep the cells out of the colony longer than necessary. Once sealed the colony no longer needs feeding. 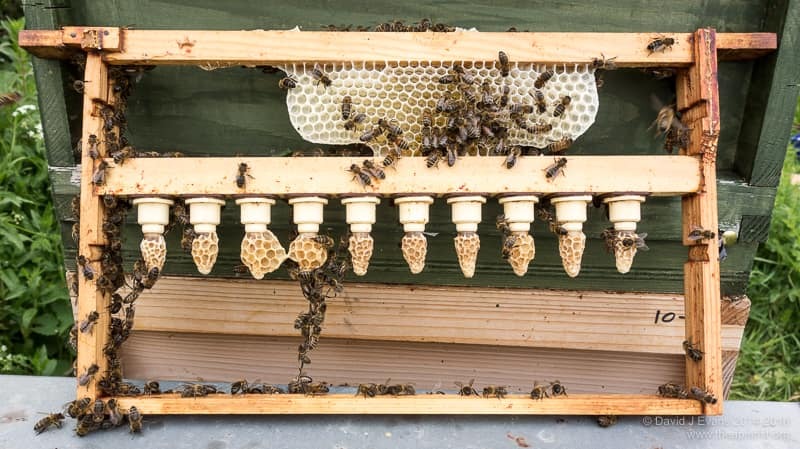 In a good flow the bees are likely to build brace comb in spaces on the cell bar frame and to fill this with nectar. Queens emerge on day 16 (counting from the day the eggs were laid), about twelve days after grafting. This is sufficient time for the colony to swarm, so you must continue with your standard weekly inspections. 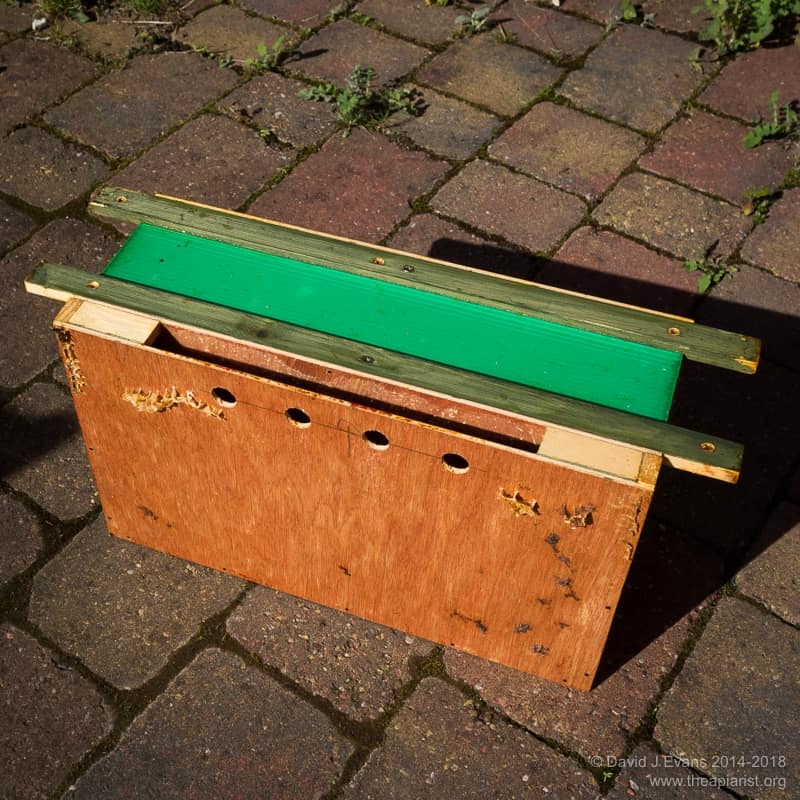 Simply lift off the upper brood box, gently put it down on an adjacent hive roof, or the upturned roof of the queen rearing colony. Remove the supers if present. Remove the queen excluder, check the bottom box for queen cells in the normal way, then reassemble. Do not forget to put the queen excluder back (or the newly sealed cells will all be torn down). You must also check the frame of unsealed brood in the upper box as they may be making queen cells on it. If so knock them all off. You only need to do this once as there should be no young larvae left once your grafted larvae are in sealed cells. 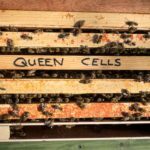 If there are queen cells in the bottom box (but they haven’t swarmed) I make up a small nuc with the queen, a small amount of brood and a frame of stores in a two frame nucleus box. I then knock all of the queen cells back. If they generate more they’ll be well behind your own grafted larvae. That being the case, use one of the sealed grafted cells to requeen the colony. If the bottom box swarm it’s not a major problem as long as there are enough bees left to keep the grafted cells warm and well fed. If you want to use other swarm control measures remember that the cell raiser has done its job now … you can remove the sealed cells and place them in a suitable incubator until you use them for requeening (just before or after emergence). The advantage of the Nicot Cupkit system is that push-fit “hair roller” cages are available to protect the cells and to prevent an early emerging queen from destroying the rest of your hard work. These can be added soon after the cell is sealed, but I usually leave them a few extra days during which time the workers provide all the care the cells need. During this period they will usually sculpt the cell extensively. The only problem is if they build lots of brace comb between cells before you get a chance to fit the cage. If they do, a little gentle surgery with a sharp knife should be sufficient to trim them down to fit into the cage. Don’t force things. You don’t want to squeeze or crush the developing queen. You should use the cells about 10 days after grafting, which gives you sufficient leeway should a queen emerge a little early. They can be added to mini-nucs, 2-5 frame nuc colonies or full colonies … all of which will be covered in the future. This entry was posted in Beekeeping, Queen rearing and tagged Ben Harden, fat dummies, grafting, queen rearing on May 23, 2014 by David. I’m delighted to be talking – twice (!) – at the Yorkshire Beekeepers Association Spring Conference in York on Saturday. With Stephen Martin (bee recognition and the Asian hornet), Jay Evans (beenomics – is that a real word? ), Ben Jones (nutrition) and Liz Collison (neonicotinoids) also on the programme it promises to be an enjoyable day. 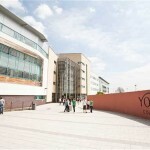 Update – it was a very enjoyable meeting and I’d like to thank the YBKA, Roger Chappel and Michael Badger for their excellent hospitality. My talk on queenright queen rearing using the Ben Harden system was well attended and generated some interesting questions. Abelo had a small trade stand selling all sorts of ‘essentials’ including some competitively priced radial extractors. 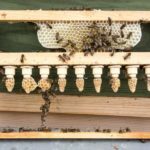 This entry was posted in Beekeeping, Queen rearing, Science, Talks and tagged Ben Harden, grafting, queen rearing, talk on April 10, 2014 by David. ‘Grafting’ is the transfer of selected larvae from a donor colony into artificial cups from which new queens will be raised. It is probably the aspect of queen rearing that beginners find most daunting in prospect – perhaps not surprisingly as it involves manually moving a less-than day-old larvae (about the size of a comma in 12 pt. Times New Roman font) to a new location. However, it’s a lot easier to do than to describe, is easy to practice and you can tell if you’ve been successful within 24 hours. In my opinion the preparation and maintenance of the cell raising colony and the use of mini mating nucs both require more skill than actually grafting the larvae for queen rearing. There are essentially two criteria that are important here – the age and the genetic quality of the selected larvae. The first of these is straightforward – you need to use larvae that are as young as possible, perhaps 12-18 hours after hatching from the egg. How do you determine the age of the larva? The easiest way is to choose the smallest larvae possible from a frame containing brood in all stages. Because the queen generally lays in rings you’ll usually find the smallest larvae right next to the oldest eggs on the frame. Fresh eggs stand up from the bottom of the cell, older eggs lie horizontally. Look around the cells containing the horizontal eggs. Suitable larvae are the same size as an egg, or perhaps even fractionally smaller. These larvae are so small they haven’t yet adopted the fully curved ‘c’ shape. One of the reasons to rear your own queens is to have bees with the characteristics you want. This is the genetic quality of the starting material. This means you need to keep records of the behaviour of your colonies, scoring them for desirable or undesirable traits. This can get very complicated, but doesn’t need to be. 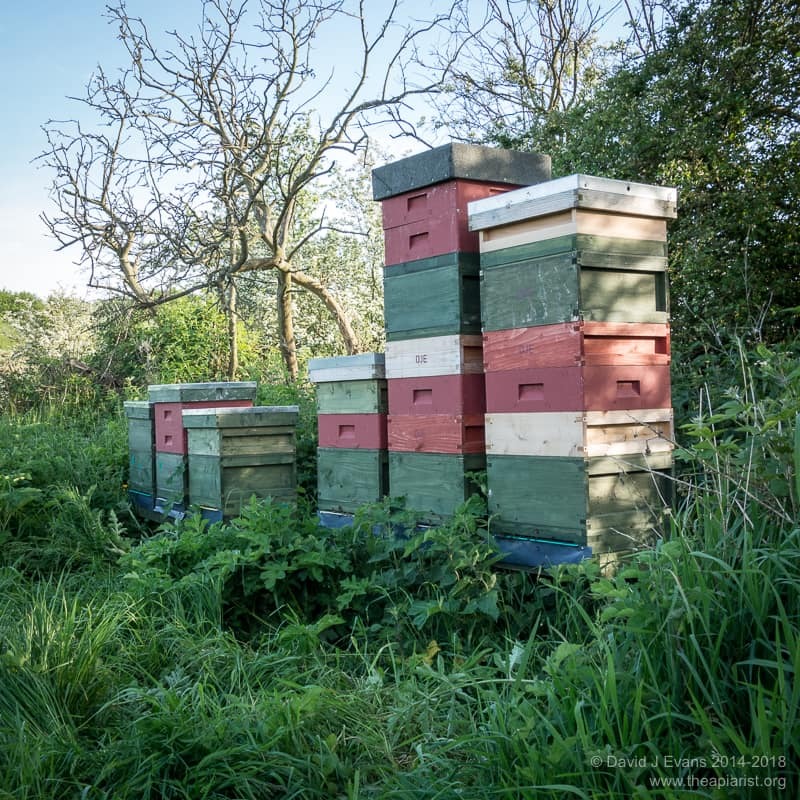 In addition to general aspects of colony health (chalkbrood, viral diseases, Varroa levels) I keep records of temper, following and running on the frame as my primary interest is working with bees that are docile and easy to handle. Temper and running are scored on a simple 5 point scale and I use colonies with consistently the best scores for grafting. Following is scored as a simple yes/no … and any that score yes are re-queened. Suitable larvae are small and you need to be able to see them clearly. You need both hands free, so do not rely on a magnifying glass. Buy a cheap set of strong reading glasses. 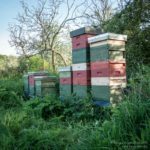 Don’t be self-conscious about this … style doesn’t matter (anyway, you probably wouldn’t be a beekeeper if you worry too much about appearance) but strength does. Check the strength you need by looking for commas on a page in a standard paperback book, probably at a closer distance than you would read a book. I don’t need reading glasses for reading, but have +2.5 dioptre glasses for grafting. There are all sorts of tools available for grafting, ranging from the cheap and cheerful – and nearly ubiquitous – Chinese grafting tool to very expensive cranked, left or right hand-specific specialist items with exotic wood handles. Try a range of different types (at least the affordable ones) to see which you get on with best. However, I recommend you first try a 00 sable artists brush. Of all the grafting tools I’ve used, this is by far the easiest in my view. Protect the bristles using the sleeve stripped from a short piece of electric flex when it’s not in use. 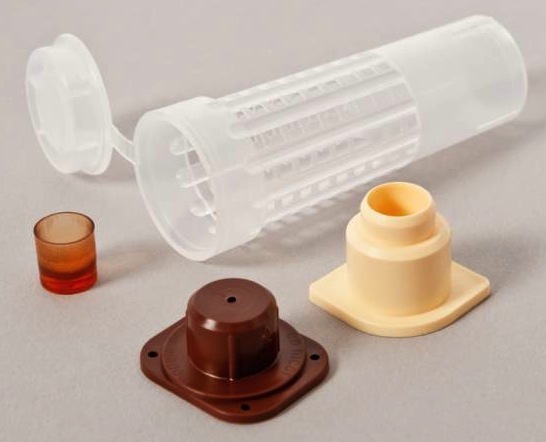 You can make artificial wax cups from melted beeswax and a rounded dowel former. Far easier though are the plastic cups available from beekeeping suppliers like JzBz. 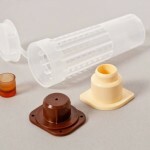 Better still are those provided as part of the Nicot Cupkit system, consisting of a dark brown spigot, a cream coloured socket, translucent brown cups and a ‘hair roller’ cage. These are available separately from suppliers like ModernBeekeeping and are inexpensive. The cell bar frame consists of a standard brood frame with one or two cross-bars to which the cups for grafting are attached. You need to be able to easily access the base of the cups. Therefore either hold the cross bar in place with a single gimp pin at either end (so it rotates), or make the cross bars slot in and out of the side bars. For the Ben Harden queenright method of queen rearing I usually graft 10-20 larvae in rows of five or ten. Firstly this type of cell raiser isn’t as strong as the sort of three box queenless monstrosities some people use, secondly I can only conveniently get about a dozen or so queens mated at any one time. Attach the spigot firmly to the cross-bar with gimp pins. Push-fit the socket onto the spigot and push the cell cup into the socket. 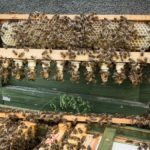 If you have two cross-bars and intend to use the hair roller cages to protect the sealed cells make sure there is enough ‘headspace’ to fit them easily – remember the bars will be covered with bees when you do this. Probably the best way to achieve this is to have the cross-bars rotate along their axis. 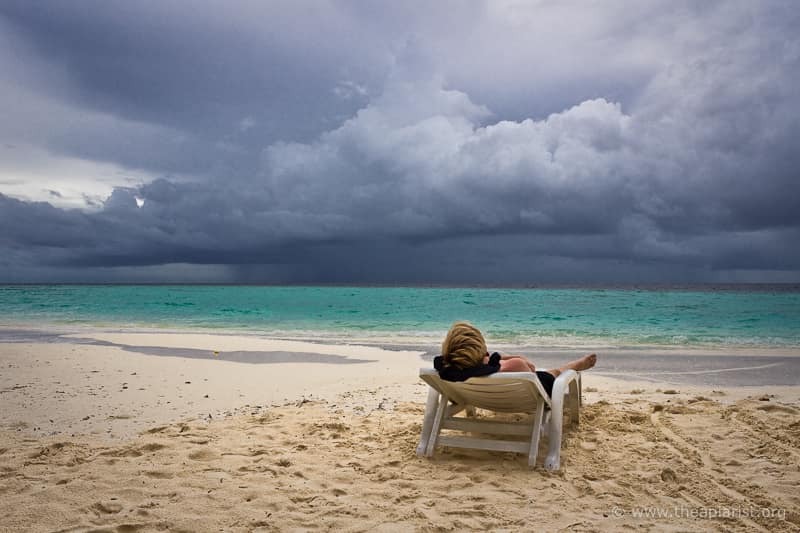 Are you sitting comfortably … ? The goal of grafting is to move good larvae from the cell in which the egg was laid into a new artificial cell, without damaging or chilling the larva. To do this you need to work quickly, carefully and efficiently. Find somewhere to sit near the donor hive that it is in light shade. Take a stool or folding chair to sit on and a piece of thin wood to lay in your lap on which the cell bar frame and the frame with larvae can be placed. Take off your veil. Make sure the things you need are close to hand – a hive tool or scalpel, your grafting tool of choice, glasses and head torch. 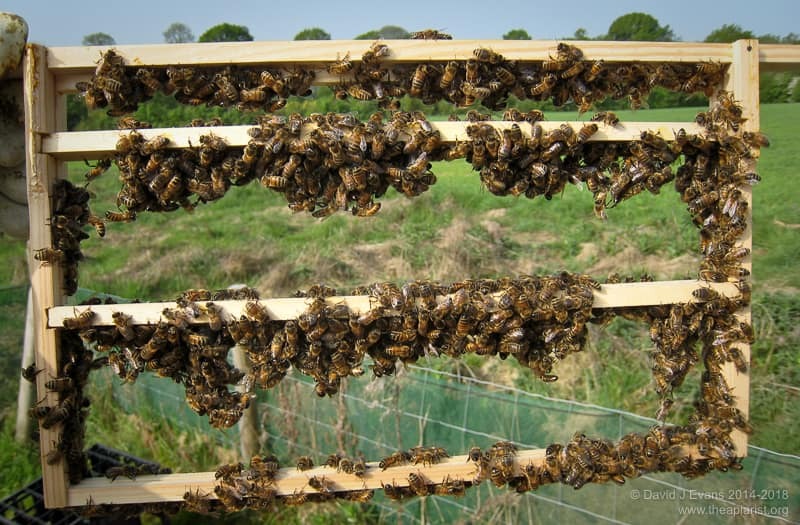 Lay a damp cloth across the board to keep both the frame with larvae and the grafted larvae in a humid environment. I usually leave the cloth hanging over each end of the board, and fold these ends over to protect the frames. Arrange the frame with the top bar towards you – that way the cells also slope towards you making it easier to see into the base. Cut down the cells using a scalpel or your hive tool – the aim here should be to improve access to the larvae in the base of the cell. I usually simply lever apart a row of cells. Working calmly and efficiently pick individual larvae from the donor frame and transfer them to the cell bar frame. The precise way you manipulate the larva differs depending upon the particular type of grafting tool in use. If you’re using a paintbrush dampen and straighten the bristles (in your mouth), slide it underneath the larva, lift it out, lower it to the base of the new cell cup and release the larva by gently rotating the brush. When you’re not searching for suitable larvae from the donor frame keep it covered with the damp cloth. Likewise, keep the grafted larvae covered other than when you’re transferring them. This way you minimise the chance of them drying out. If you have trouble transferring a larva, if you end up rolling it around the cell cup, if it sticks to the side wall or if there’s any doubt at all about it then flick it away, lick the brush again and choose another. It probably takes 30-45 seconds per larva when they’re easy to find. You can minimise this time by cutting down the wall of a row of cells and then working your way along the row, grafting each in turn. Don’t worry if it takes longer. The more practice you get the more efficient you will become at finding and transferring larvae. An acceptance rate of 80-90% should be expected with a little practice. Gently return the cell bar frame with the grafted larvae to the cell raising colony. Use minimal smoke … you want the larvae to be accepted straight away and fed with copious amount of jelly. Remember that the cell cups containing the grafted larvae must be vertical. Don’t forget to return the frame of unused larvae and eggs to the donor colony. You can (and indeed should) check whether the grafted larvae have been accepted 24 hours after introducing them to the cell raising colony. 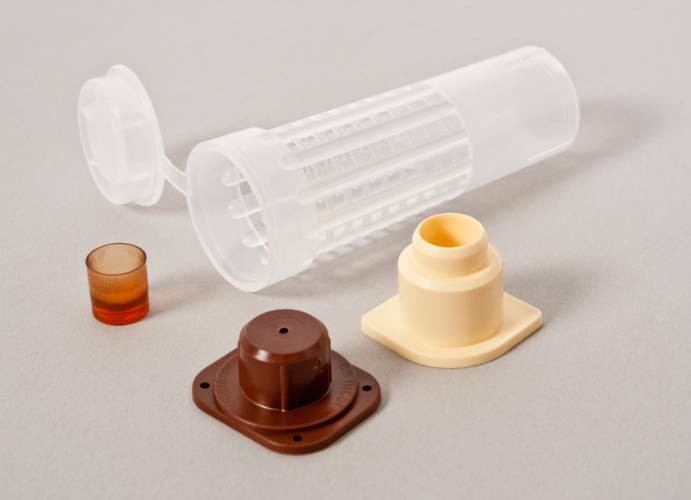 Open the colony with the minimum use of smoke, gently raise the cell bar frame and look for a 3-4mm wax ‘collar’ around the edge of the plastic cell cup. If you look into the cell there will be a good bed of Royal Jelly with the larva floating on top. Grafts that have not been accepted might have a thin trace of wax around the cup edge, but nothing like 3-4mm. If the overall acceptance level is low consider grafting again straight away. There is no need to reacclimatise the frame, simply pull out the cell cups and replace them with fresh ones. You even know which frames have day old larvae in them … they’re the ones which had horizontal eggs yesterday. 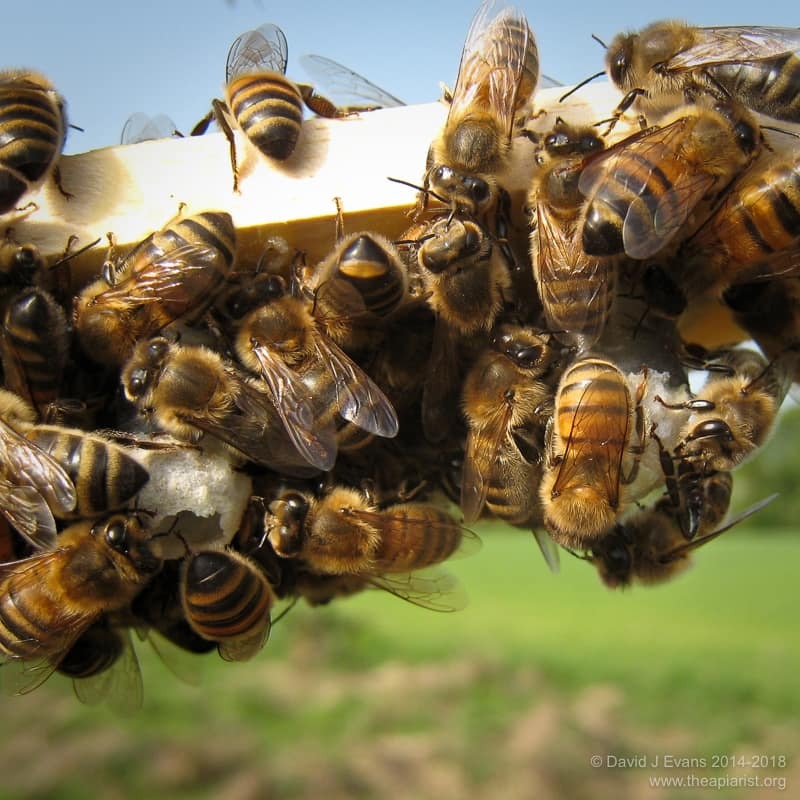 This entry was posted in Beekeeping, Queen rearing and tagged Ben Harden, grafting, mating, mini nucs, queen rearing, talk on March 30, 2014 by David. The Ben Harden queenright method for queen rearing (introduced previously) has relatively few requirements for specialist equipment. 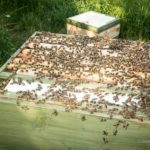 Most beekeepers will already own the necessary bits and pieces, and will be able to build, borrow or steal the things they lack as appropriate. 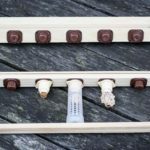 The colony is prepared by adding a second brood box to a standard production colony, separated by a queen excluder. 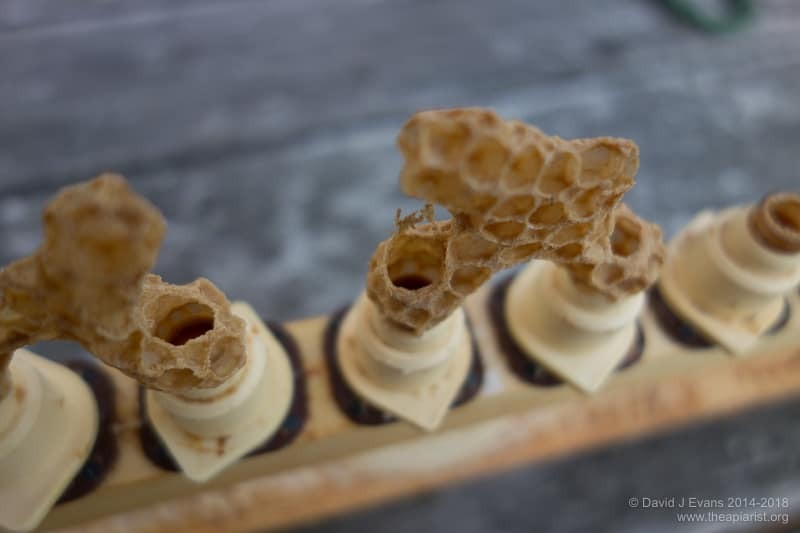 The upper box contains just four frames – two containing ample levels of pollen, one containing unsealed brood and one containing your precious grafted larvae. The remaining space in the upper box is occupied by two oversize ‘fat dummies‘ that concentrate the bees onto the frame containing the grafts. The cell raising colony – the one you’re going to setup the Ben Harden system in – needs to be strong, healthy and not about to swarm. The genetics of the colony don’t matter – they’re not going to contribute anything other than hard work to raising your grafted larvae. Before using the cell bar frame for grafting paint it liberally with thin syrup and leave it to acclimatise in the cell raising colony for 24 hours. This isn’t critical; you can graft directly into cells that haven’t got the scent of the hive from having workers clean all the syrup off for a day or so. I’ve not noticed any real difference in the proportion of grafts that are successful. However, I think an additional advantage of setting things up a day in advance is it means the colony isn’t too disrupted by an inspection and frame rearrangement on the day the grafts are added. 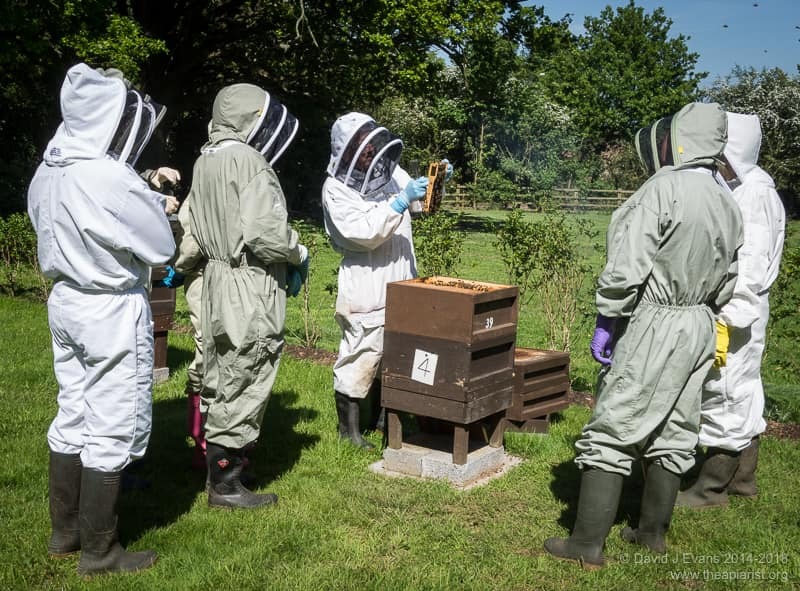 Therefore, on the day before grafting, inspect the colony to make sure they’re queenright – you don’t need to see the queen, just make sure there are recently laid eggs present. Check for queen cells to be sure they’re not making preparations to swarm. The cell raising process takes a little over a fortnight, so make sure they have enough space to expand into during this time. 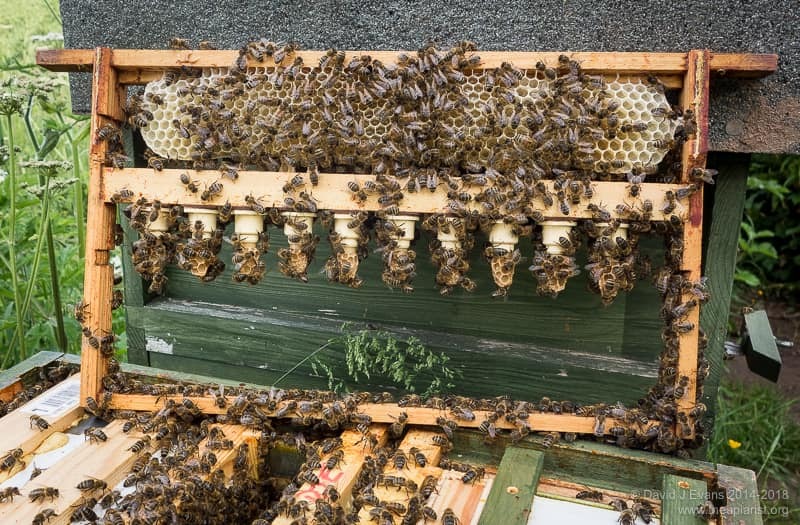 To encourage the nurse bees up into the upper box you need a frame of unsealed brood – this can come from another hive if needed (just shake the adhering bees from it) or from the bottom box. You also need to provide ample amounts of pollen and so need two additional frames well stocked with pollen. Again, these can come from the bottom box or from another colony. If pollen-filled frames are in short supply but you have a source of pollen available (for example, collected and frozen from a previous year) you can sprinkle it liberally across the face of two drawn frames and use these. 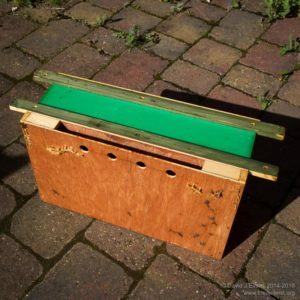 Any frames removed from the bottom box should be replaced with drawn comb – you don’t want to distract the bees with having to draw out foundation. With the bottom box filled with a full complement of frames add the queen excluder and the empty top box. Put the two ‘fat dummies’ on either side, filling the gap in the middle with a pollen frame, the syrup-coated cell bar frame, the unsealed brood and the second pollen frame. Make sure the pollen frames have the faces most heavily loaded with pollen towards the cell bar frame. If the colony has supers on it these can be added directly on top of the upper brood box. 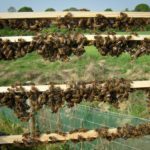 One of the advantages of the Ben Harden method is that it has minimal impact on nectar gathering … in fact, the only real drawback of having a stack of supers on top is all the heavy lifting you have to do to access the grafted larvae. 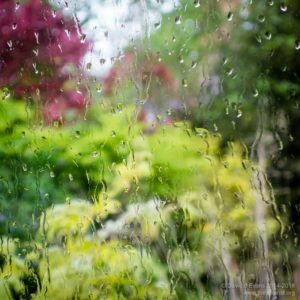 That’s it … hope for good weather the following day when you’ll be grafting. This entry was posted in Beekeeping, Queen rearing and tagged Ben Harden, mating, queen rearing, syrup on March 30, 2014 by David. 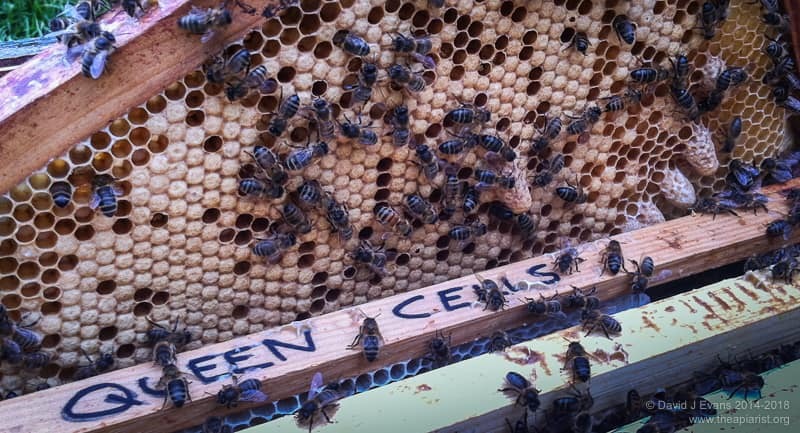 The ‘Ben Harden’ method is an approach used to raise queen cells in a queenright colony. 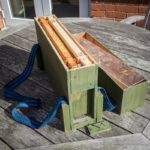 It offers a number of advantages that make it particularly suitable for relatively small-scale beekeepers, for beekeepers who want only a limited number of queens (10’s rather than 100’s, though the latter is possible if well organised) or for beekeepers who are taking their first steps in queen rearing. Consequently, it is also suitable for using within an association during queen rearing courses. 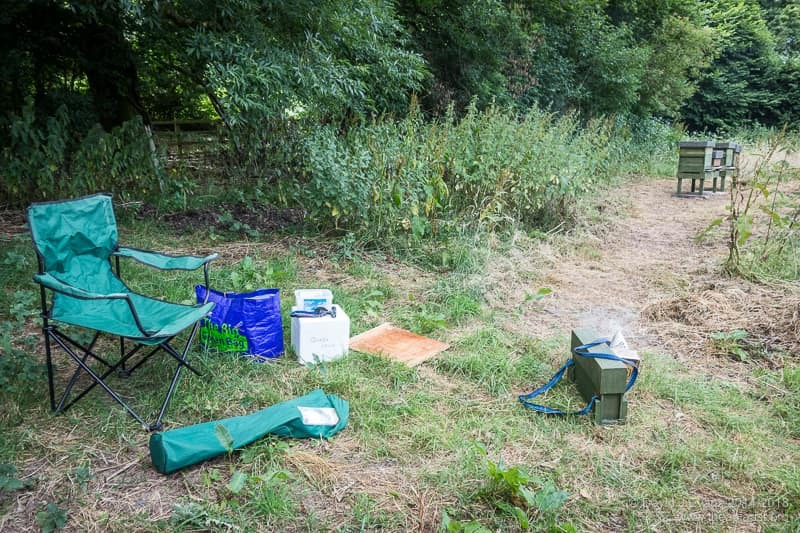 The general principles of this approach are straightforward and are reasonably well described by the late Dave Cushman modified from an article by Ben Harden in Bee Improvement (the BIBBA magazine). 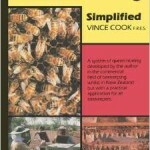 Further information is available in A simple method of raising queen cells written by Ben Harden (#59 in the Beekeeping in a Nutshell series available from Northern Bee Books). 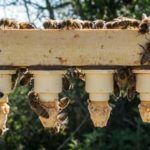 It is possible to use this method to raise queens if you start with a single colony, using it as a source of larvae, the cell raising colony and the colony used to harvest nurse bees for populating the mini-nucs from which the virgin queens will be mated. This is not really recommended … at the very least you need a range of colonies to judge and choose the best as the donor for the larvae. It is a also very good method to use in associations running queen rearing courses. Individuals taking part prepare a colony for cell raising, grafting is done communally using good stock and cells are distributed 24 hours after grafting. This entry was posted in Beekeeping, Queen rearing and tagged Ben Harden, fat dummies, grafting, hive, Kieler, mating, mini nucs, queen rearing on March 30, 2014 by David. The ‘Ben Harden’ queenright queen rearing method uses a double brood box in which much of the space in the top box (above the queen excluder) is filled with oversize dummy frames. These have the effect of forcing bees in the top box to be concentrated on the frames containing young larvae and, critically, the grafted larvae in the cell bar frame. Normally the frame containing the grafts is accompanied by a frame of unsealed brood and two frames containing ample levels of pollen. The fat dummies that flank these occupy the remainder of the box and therefore each need to be the thickness of three and a half frames (i.e. 133 mm). 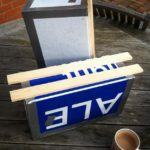 They can be built from pretty much anything convenient – thin plywood around a softwood frame or Correx held together with duct tape work equally well. To make them slightly more useful they can be filled with expanded polystyrene chips. 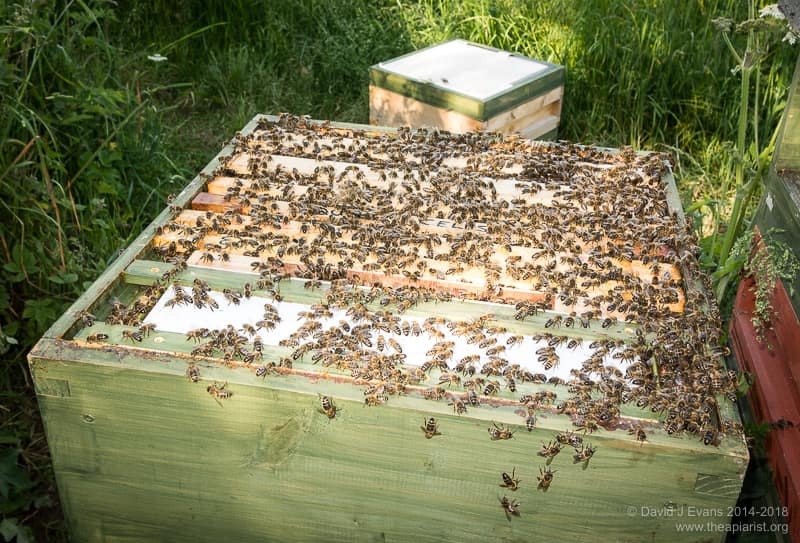 They can then be used to ‘dummy down’ a weak colony in a standard brood box for the winter, effectively converting it to a four-frame nuc (assuming two are used) without having too much dead space for the bees to keep warm. If there is no flow grafted larvae will usually be ignored. 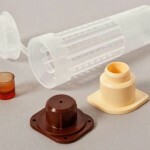 To avoid this it is necessary to simulate a flow by feeding with thin syrup. It is therefore useful to build at least one fat dummy with an integrated frame feeder. Dave Cushman describes construction of fat dummies with a very narrow feeder, negating a requirement for a wooden float. Mine are wider, about 20mm, because that was the size wood I had at the time … I’ve not had problems with them being a bee graveyard. 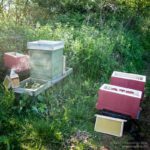 This entry was posted in Beekeeping, DIY, Queen rearing and tagged Ben Harden, DIY, fat dummies, Nucs, queen rearing on February 7, 2014 by David.